Security Cabinet makes five decisions regarding Operation Pillar of Defense, including allowing the IDF to mobilize reserves. The Security Cabinet held a meeting on Wednesday evening in which it made five decisions regarding the IDF’s Operation Pillar of Defense that was launched on Wednesday afternoon. 1. To direct the IDF and the ISA to continue vigorous action against the terrorist infrastructures operating from Gaza against the civilian population in Israel in order to bring about an improvement in the security reality and allow a normal life for the residents of the State of Israel. Alongside the military effort, Israel will, to the best of its ability, work to avoid harming civilians while honoring the humanitarian needs of the population, in keeping with the rules of international law. 2. To direct the IDF, the Home Front Defense Ministry, the Israel Police and all relevant agencies to take all necessary measures in keeping with Defense Minister Ehud Barak's statement regarding the declaration of a special home front situation. 3. To allow the IDF, as per need and with the approval of Defense Minister Barak, to mobilize reserve units. 4. To direct the National Information Directorate and the Foreign Ministry, in conjunction with all relevant agencies, to explain Israel's actions, in Israel and in the international arena. 5. To authorize Prime Minister Binyamin Netanyahu, along with Defense Minister Barak and Foreign Minister Avigdor Liberman, and in consultation with other ministers as per need, to decide, on behalf of the Security Cabinet, regarding the actions necessary to continue with Operation Pillar of Defense and to submit other decisions for Government approval, as may prove necessary. Earlier on Wednesday evening, Netanyahu and Barak held a short news conference in which they announced the goals of the operation. Netanyahu said that the operation will be widened if necessary. He explained that recent Hamas attacks like the explosive tunnel – part of which was inside Israeli territory – and the firing of an anti-tank missile at an IDF jeep, necessitated IDF action. Israeli President Shimon Peres spoke on Wednesday with his American counterpart, Barack Obama, about the operation. Peres told Obama that Israel did not want things to escalate but was forced into a position where it had no choice but to defend the population in the South that was exposed to unbearable conditions, as he said. 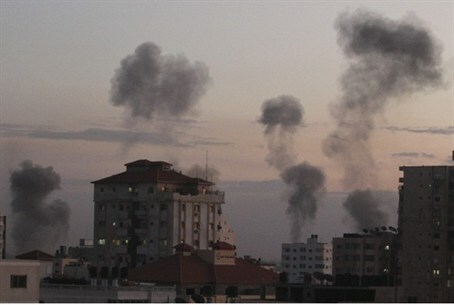 “For five days rockets were continuously fired at Israel. Mothers and children cannot sleep at night. I visited Sderot this morning (Wednesday) and saw with my own eyes the pain of the mothers and children, the difficulty of the south. There is a limit to how much Israel can absorb." Meanwhile, Egyptian President Mohammed Morsi recalled the Egyptian ambassador to Israel, Atef Mohamed Salem, over the operation.